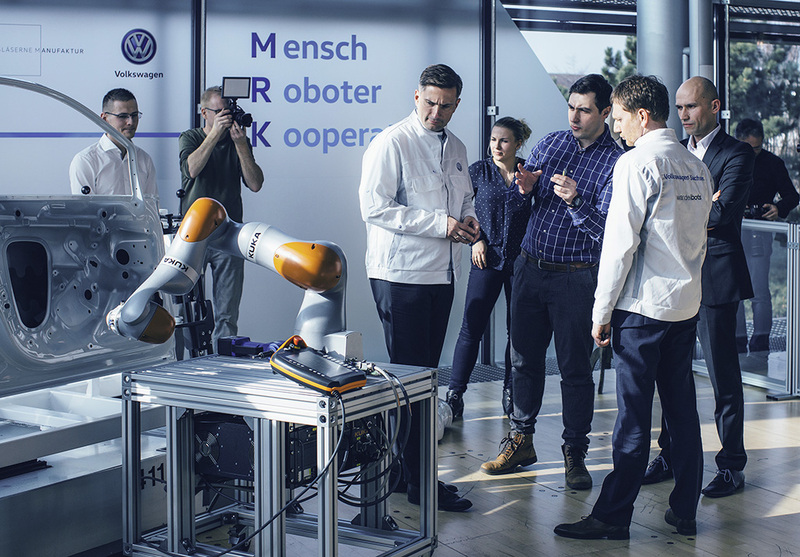 VW is collaborating with Saxony startup on the development of industrial collaborative robots fitted with sensor jackets and actuators for improved production. Volkswagen’s Gläserne Manufaktur (Transparent Factory) and Dresden-based start-up Wandelbots have established a novel joint venture in human-robot collaboration (HRC). The company announced at the “South by Southwest” technology festival in Austin, Texas (USA) that it aims to establish and operate an innovative testing station at the Gläserne Manufaktur in order to test new HRC applications in vehicle end assembly to prepare them for serial production. The plan: to efficiently train industrial robots using an innovative sensor jacket fitted with sensors and actuators. The activities in Dresden will cover the assembly, logistics and maintenance of Volkswagen’s electric Golf production. This young start-up, spun off from the TU Dresden, considers the partnership with Volkswagen to be a “breakthrough”. “For the first time, we have the opportunity to test out our product with a major industrial partner,” said Christian Piechnick, Founder and Managing Director of Wandelbots, at the US conference. “From this partnership, Volkswagen hopes to bring automation projects to bear in industrial applications more quickly and with significantly reduced expense,” said Marco Weiss, Head of New Mobility & Innovations for Gläserne Manufaktur, and based in Austin. Saxony’s Minister President Michael Kretschmer welcomed the new partnership. “We are very pleased about this ground-breaking partnership. It shows how quickly leading research from Saxony can be applied to industrial practice – an exemplary partnership.” The State of Saxony has supported Wandelbots through the Smart Systems Hub Dresden and with the regional campaign “So geht sächsisch” – loosely translated, “how it’s done in Saxony”. Part of this campaign has involved presenting innovative start-ups and ambassadors such as Eric Weber from Leipzig-based SpinLab in Texas in order to promote Saxony as a centre of industry and its leading role in digitisation. “With its funding schemes, our state offers the ideal conditions for founders and entrepreneurs,” said Kretschmer. “With industry steeped in tradition, strong representation of Germany’s renowned Mittelstand, leadership in research and a lively start-up and entrepreneur scene, this region continues to produce new talent time and again.” He added that efforts would be ongoing to unite start-ups and industry in order to bring value creators to Saxony. State capital Dresden also supports young founders. “Dresden is a leading digital location for base IoT technologies. No other region in Europe offers such extensive technological expertise in the fields of semi-conductors, software and connectivity. To enable new products and technologies to achieve a breakthrough, we as a city provide innovative projects and start-ups with financial support. This is how we have supported Wandelbots, which has advanced the digitalisation of production with smart automation technology and shown how man & machine can work together hand in hand in the future,” said Dr Robert Franke, Head of Economic Development of the State Capital of Dresden, in front of the media in Texas. Wandelbots is working on a product that enables industrial robots to be programmed quickly with the aid of smart clothing, for which items of clothing are fitted with various sensors and actuators. The sensors detect human movements in real time, while the actuators provide haptic feedback. The sensor data is wirelessly transmitted to a software program, which controls a robot based on the movement data. “This allows a robot to be taught a clearly defined task by way of example and imitation,” explained Christian Piechnick. The software running in the background was able to generate an automation process based on data from multiple training runs, and the robots were also capable of adapting independently to the individual requirements of their human colleagues, Piechnick added.